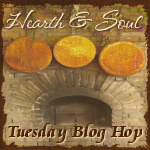 It’s time once again for the Hearth and Soul Blog Hop – welcome! The Hearth and Soul Blog Hop is the blog hop for recipes using healthy ingredients, family and comfort food recipes, articles about healthy living, real /slow/ local/sustainable food, foraging, herbal remedies, organics and gardening. As much as possible, recipes should be homemade from scratch. It’s a busy time in our house at the moment. We’ve had quite a few visitors so I’ve been cooking up a storm – my Coffee and Almond Cake is always a favourite with guests. I’m also looking forward to celebrating Shrove Tuesday with my family – making pancakes on Shrove Tuesday is a tradition in our house! Today I’m featuring some of the delicious breakfast ideas that were shared with last week’s hop. If you are looking for breakfast inspiration these recipes are a great place to start! We would love it if you would please share the Hearth and Soul Hop badge to help promote the hop! Don’t miss out! Sign up for my weekly newsletter in the box below the comments. Hi, April! I enjoy these themed features. My recipe does use packaged pudding mix (in the interest of time–this project was time consuming), but everything else is from scratch. It’s morning here now and I’d loooooooooove to eat these delicious pancakes!! Thank you, Winnie 🙂 Hope you have a lovely day too! A house full of guests… fun and exhausting. Enjoy. Thank you so much for including my Morning Glory Muffins they are big favorite where I live. My pleasure, Diane 🙂 Thank you for sharing them. Breakfast is my favorite meal and I love all these new recipes you featured. Thanks so much for featuring my French Toast Casserole, it’s a favorite in our household! After writing and sharing recipes for Fat Tuesday, I totally spaced it! I just told my dh we were having spaghetti and meatballs for dinner since it’s Girl Scout troop meeting night. Thanks so much for the party! Best wishes for tasty dishes! I hope the weather has been clearing up over there. What a wet winter you’ve had. Thank you, Mireya! It is clearing up a bit in the UK, although we had some rain earlier this week. I’ve ‘escaped’ to California for a couple of weeks – it’s lovely to feel warm again! My pleasure, Christine! Ooh, Irish Hot Chocolate, now that sounds really good! I love St Patrick’s Day 🙂 Hope you have a wonderful week too! Hi April, Thanks for hosting a great party. I always enjoy finding new ‘healthier’ recipes. I added banana nut muffins even though breakfast was last week’s theme. They are great for dessert too. my very own blog and would love to find out where you got this from or just what the theme is called.